With encouragement from P and colleagues at the office, I took the afternoon off last Wednesday so I could go to the Mending Project while Lee Mingwei was there. He was doing the work only for the first two weeks of the biennial, and because I wasn’t organized on the weekends, I had to take an afternoon off at short notice. I had seen a piece about it on the local news (thanks to P) and was very excited about it. Possibly so excited that I was driving other people crazy talking about how I wanted to go, but I had a lot to do at the office, but it would be such a shame to miss it, etc. ; and that could be the reason people were so encouraging for me to just go already! It took me a while to decide which garment I wanted to have mended. The jumper I’d been wearing at work until I finally notice a huge hole in the arm? The denim jacket I’ve treasured since a friend gave it to me in college? The striped shirt in my current mending pile? Yes, I could continue listing my clothes with holes for quite a while. I finally decided on a tan shirt, which I remember my mom buying at a garage sale because it looked warm. This may be a false memory, or a mash up of two different incidents, but anyway, I’ve had the shirt a while. It’s difficult to describe why I like it- it’s a synthetic, and a rather dull tan, but I like the way it hangs in a sort of saggy way. There were two little holes in the back which I had tried to mend years ago, but I gave up wearing it when I noticed another little hole in the front. When Lee Mingwei saw it, he sort of teased me that no one would notice the hole when I was wearing it, but he understood how since I knew it was there, I would feel like everyone would notice. It made me reflect that I usually only notice people’s clothes when it’s something I like. His mending with bright threads forming a tassel will definitely be noticed. He asked me if I was an artist and I rather awkwardly explained how I didn’t think of myself that way. I asked how he felt about someone else taking over working in the project next week. He said that the sharing of the project was part of it, he’s enthused about the other people participating in it, ‘I told them, once you sit here, it’s your project.’ He didn’t use the term control freak, but making the project open to others is a positive part of his whole idea of the Mending Project. It reminded me of the open source software ethos. Though the Mending Project uses thread and fabric, it is much more about ideas: involvement, making contact and giving, creating value. I also asked how he had selected the threads for the project. A friend at the office said they were like a rainbow on the walls of the workspace. Turns out, he had ordered them as a selection pack! I strongly encourage anyone to go to the Mending Project while it is in Liverpool, and do take a garment to be mended, have a chat with whichever artist is there, and just enjoy participating. I found it quite inspiring, and I’m wondering if I could do a similar sort of thing by returning the lost buttons I’ve been collecting. If you do go to the Mending Project, let me know if you see my old tan shirt there. When I pick it up at the end of the show, I will start wearing it to the office again, so plenty of people will get a chance to see it as I sit on the bus. While in Liverpool, I went along to some of the other pieces in the biennial. Lots are video installations, which aren’t really my thing (perhaps I’m too impatient for them). I liked Bridging Home by Do Ho Suh, and there’s lots of graffiti in that area, too. 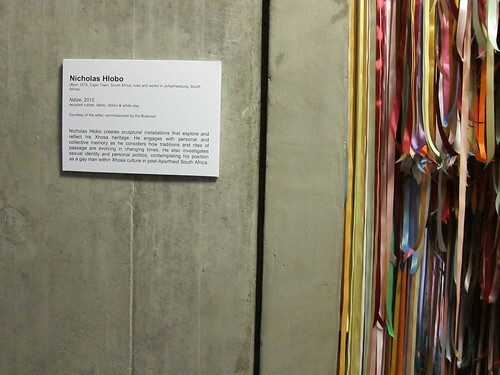 For fabric enthusiasts, and for anyone else really, Ndize by Nicholas Hlobo at the Bluecoat is just a brilliant experience. The intricate work on the rubber and ribbon outfits appeals to my fabric senses, but walking through the maze of ribbons in the room upstairs, well, I just don't have the words to describe it. Sensual, beautiful, and just a little bit scary. On a crafting note, I made progress on the Secret Project on the train, but that’s all I’m saying. It’s bad enough that P knows there is a Secret Project.